Below is an article I wrote for The Conversation. Kudos to their editors – they’re great to work with! Over the past few weeks, Australia’s grand mufti, Ibrahim Abu Mohamed, has been criticised by government MPs and sections of the media over his response to the Paris terror attacks. He [the grand mufti] has more of a responsibility not only to the Muslim community but to the community at large. There are young people who hang off every word that’s said … these young people who are being radicalised online need counter messages. Despite the belief that the grand mufti can – and should – crystallise the sentiments of Australian Muslims, given their sheer diversity, how representative is he of the broader community? If we focus on the structure and “representatives” of communities, there have been episodes in Australian history from which we can draw a few elements of comparative experience. Of these, the story of German migration to South Australia can highlight the experience of diverse communities, and what can occur to them in a time of serious conflict. Germans in pre-first world war South Australia have primarily been viewed as “Barossa Lutherans” – a pious, hard-working group of rural migrants who, seeking refuge from religious persecution, contributed to South Australia’s development. There is truth to the stereotype. Of about 10,000 Germans who migrated to South Australia between 1838 and 1914, the vast majority settled in the Barossa Valley and rural districts of the Adelaide Hills. Many continued to participate in the “life-cycle” rituals offered by church sacraments, such as baptisms and marriages. German-language schools also maintained their importance for the rural communities. However, when the first waves of migrants arrived in South Australia in the 1830s and 1840s, Germany did not exist. These “Germans” were Austrians, Brandenbergers, Pomeranians and Silesians – separated by confession, regional dialects, laws and traditions. Likewise, while Muslims in Australia may be bound together by a common religion (also taking into account denominations like Sunni and Shi’a), the community constitutes a large number of nationalities. It spans numerous languages and cultures, with about 38% of the community born in Australia. From the late 1840s, the socioeconomic and occupational profile of German migrants became increasingly urban. Migrants’ lives also grew distant from the auspices of the Lutheran Church under pastors August Kavel and Gotthard Fritzsche. In 1854, a group of middle-class Germans established the Deutsche Club (German Club). From their grand rooms on Pirie St, the club’s members represented a mixed identity – embracing their home in South Australia and the emergent discourse surrounding German nationalism. Members of the club – including men (women were generally left to the domestic sphere) like Friedrich Basedow, Friedrich Krichauff and members of the Homburg and Muecke families – would become community leaders. In embracing roles as members of state parliament, German-language newspaper proprietors and justices of the peace, such Germans sought to bridge the city-country divide among migrants – uniting South Australia’s portion of the German diaspora. Between the late 1870s and the mid-1880s – on the back of attempts to induce the arrival of “sound” German migrants via cheap passage fares and promises of land – a number of working-class migrants made their way to Adelaide. In 1886, a group of them founded the Sued-Australischer Allgemeiner Deutscher Verein (South Australian General German Association), which attracted upwards of 600 English- and German-speaking members by the turn of the century. 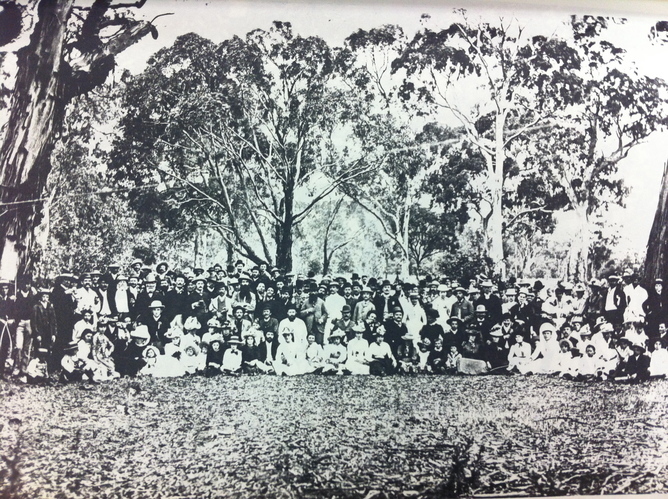 Drinking, dancing, rifle shooting, singing, stage performances and picnics were a few activities available to members. 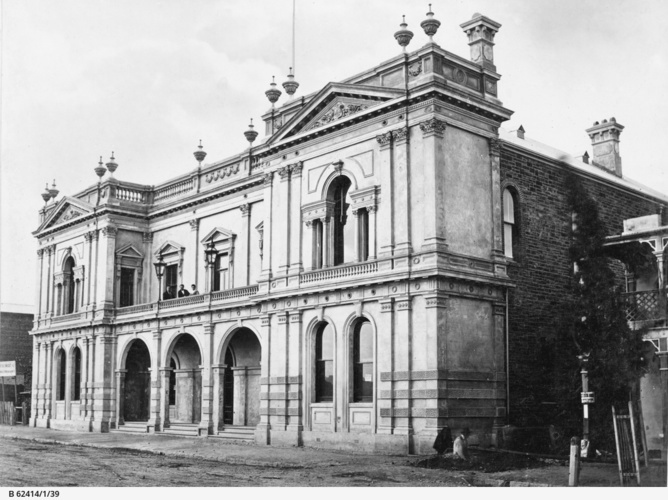 The Verein became an important node within the network of “democratic societies” operating in Adelaide. This in no small part led to the formation of the United Labor Party in 1891. I am sure scores of my countrymen will consider the place better employed as a warehouse … than that half-a-dozen Tories should use it for talking platitudes about the German Empire. Whereas members of the Deutsche Club sought to promote “deutschtum” (German language, culture and customs), members of the Vereinsought to advance the aims of social democracy and the broader labour movement. These examples go some way in problematising notions of an essentialist “German” community. Similarly, the Australian National Imams Council is but one of a large number of Islamic organisations in Australia. Some reflect national divides but also attempt to reach across them through grassroots community organisation, such as the Lebanese Muslim Association. Others focus on gender issues. Following the outbreak of war in 1914, anti-German sentiment overrode acknowledgement of such diversity. Germanophobia and the curtailment of civil liberties were expressed in the internment of “Germans” on Torrens Island, closure of social clubsand schools, calls for resignation from public office and the renaming of “German” towns. Given this example, as well as the current debate surrounding Muslim “radicalisation”, we could perhaps look to comprehend migrant and minority communities from the grassroots up. We could look more critically at all-encompassing notions of a particular “group” and those who claim to speak for it. In doing so, we may have a better chance of assessing and resolving the problems facing immigrants and minorities in Australian society. It was interesting to read in Wednesday’s Advertiser (11/02/15) that SA Labor is seeking to broaden the scope of the land tax. Drawing on Henry George’s 1879 tract, Progress and Poverty, certain members of the South Australian labour movement in the late 19th century believed that by introducing an expansive land tax – charging higher rates for undeveloped land – property owners would have no recourse but to make productive use of it. Those in favour argued it would increase investment, and inturn employment, benefiting an economy hit hard by the fluctuations of agricultural output. The land tax was most vehemently supported by a host of ‘democratic societies’, who would successfully lobby for its inclusion on the South Australian United Labor Party’s policy platform throughout the 1890s, and the early years of Federation. Taking into account the current economic conditions of SA, one looks forward to the commentary on the modus operandi of this particular initiative. This blog post is part of a series of essays commissioned by Queensland State Archives and written by historian Dr Murray Johnson. Before the outbreak of the First World War in August 1914, German migrants were held in high esteem for their industriousness and agricultural skills. Successive Queensland governments actively encouraged German immigrants, who came to dominate rural communities in the Logan River district, Lockyer Valley, Darling Downs, Binjour Plateau in the Burnett, and centres in the far north. 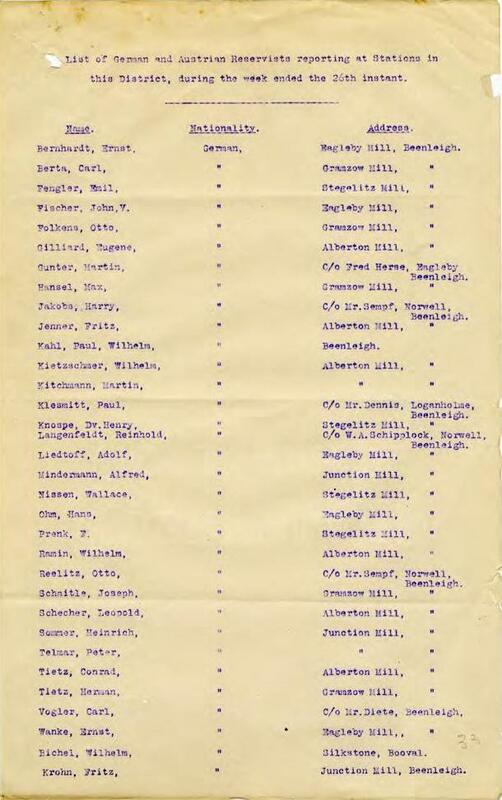 With the declaration of war, however, the strength of that admiration was soon to be tested, and as records at Queensland State Archives reveal, it was often found wanting. THE article “Just kill Westerners” (The Advertiser, 14/10/14) drew an interesting parallel with events in South Australian history. Like “Muslims” of today, being defined as a “German” in South Australia during the first quarter of the 1900s was the gross simplification of a complex identity. Confession, class, political ideology and region of origin were the cornerstones of the many disparate communities formed by “Germans” upon arrival in South Australia. With both the Boer War and the growing militarism of Imperial Germany under Kaiser Wilhelm II, suspicions heightened over German colonists’ allegiances. Given that the outcomes of this “German” label included expulsion from representative office, closing of social clubs, and internment on Torrens Island, we could do well to ponder our history. – Published 17/10/14 as ‘Suspicious Minds’.